First came the shock of it. A press released dated Monday, April 6, stated, in no uncertain terms, that the University of Wisconsin-Oshkosh would no longer sponsor a men’s soccer team after the 2016 season. Surprising? There had been no clues the decision to cut the program was being considered, much less that it was imminent. The shock of the announcement to past and present Titans soccer players and coaches was followed by disbelief, then anger, then sadness, then disappointment. “Initially, obviously, we went through the whole grieving process,” said Danny Kobin, a UW-Oshkosh senior who last fall exhausted his four years of soccer eligibility. The process played itself out quickly, eventually reaching the action stage. Action meant devising a plan and executing it. Action meant forming committees (public relations and marketing, fundraising and legal matters) of current and former Titans players willing to help the cause. Action meant creating an online petition, social media accounts and a way to solicit donations and pledges. Action meant creating a document that explains why it’s important to save UW-Oshkosh soccer. The group reached out to Sport Ngin Director of Customer Success Ken McGinley, one of the company’s longest-tenured employees. McGinley has a history of working with soccer organizations in the Oshkosh area. One of McGinley’s first clients was the FC Green Bay Soccer Club, which came onto the platform in 2008. As it happens, UW-Oshkosh men’s soccer coach Wytse Molenaar is also one of the directors of coaching for FC Green Bay. McGinley gave Kobin, Pawlyshyn and other committee members a tutorial on how to add photos and graphics to the background and header of the site through the admin control panel. He also showed the basics of adding page elements. Because a custom design wasn’t required, the Save UWO Soccer site was up and running immediately, and the initial content was being posted in a matter of hours. 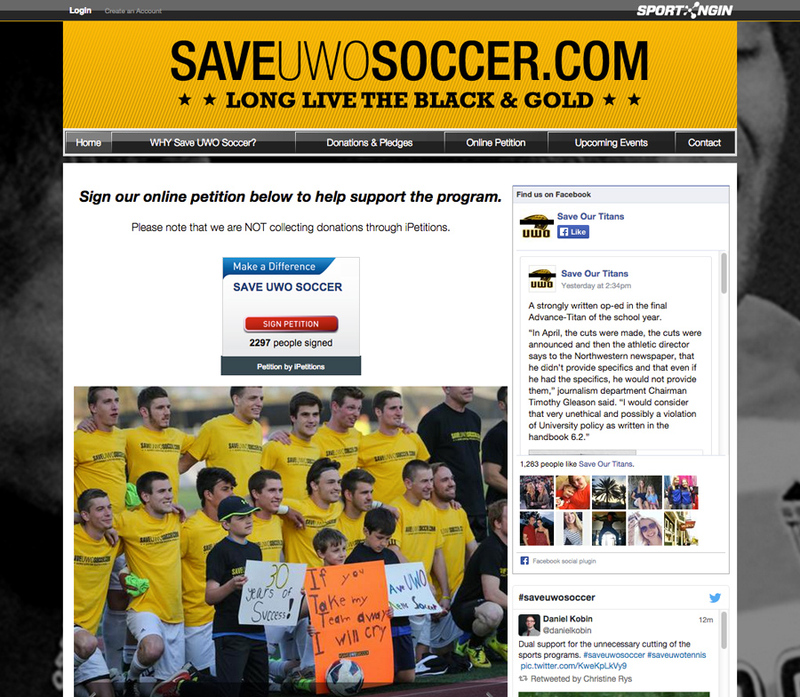 The link to sign the petition to Save UWO Soccer sits front and center on the home page of the site. As of May 8, the petition had collected 2297 signatures. Among the more prominent supporters are ESPN soccer researcher Paul Carr and former U.S. National Team and Major League Soccer player Jay Demerit. Facebook and Twitter feeds also are displayed prominently on the home page. A photo gallery that includes images from the team’s May 2 alumni game was recently added. “It was great for the existing guys,” Molenaar said about what was a huge turnout for the annual alumni event. “It showed them that there a lot of guys pulling for them. We had guys coming from all over -- Colorado, Texas, Minneapolis, Illinois, Iowa. Ohio. A Donations & Pledges page was recently added to the site. A form has been created to gauge initial interest in pledging money to help fund the program. “We have been spreading the word, and we have basically reached out to a nationwide audience,” Kobin said. “This movement is going to continue to grow. If that takes a couple of months, if that takes a year or two, we are going to keep going. “I think the way the decision was made sort of reflects what could happen to other programs in the future. This is something all other student athletes should be worried about. If the university does accept us doing private fundraising, what we’re doing could benefit not only the soccer programs but other programs in the future.